In 1988 we began our venture as Sanibel Air Conditioning serving the islands of Sanibel and Captiva. We started out with one employee and a company vision – “To provide our customers with quality, reliable service when you need it, and remembering our customer’s names”. Over time we have grown to 14 staff members and we still believe in the same company vision. We focus exclusively on providing homes and businesses on Sanibel and Captiva and the surrounding areas of Lee County with the best quality air conditioning service available in the market today. 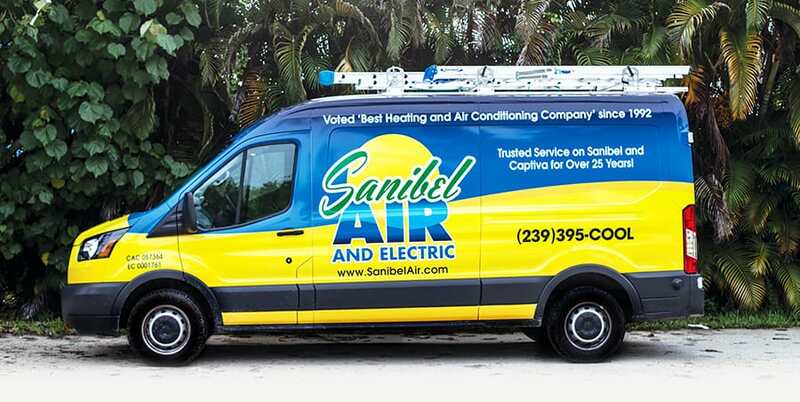 In 2013, we officially became Sanibel Air & Electric Inc. after Sanibel Air Conditioning officially merged with its sister company Sanctuary Island Electric, Inc.
We believe that the service we offer our customers is the best around! Sanibel Air Conditioning has been voted the ‘Best Heating and Air Conditioning Company ” in the Best of the Islands Awards – since 1992. We are passionate about our work and focus on doing quality, reliable and affordable service. All our service engineers and technicians are fully trained and have continued to hone their skills through manufacturer training and regular workshops. We have been a proud member of the Sanibel & Captiva Chamber of Commerce since 2003. Sanibel Air & Electric, Inc. is ever expanding with more trucks and employees, but our vision remains the same; “To provide our customers with quality, reliable service, being there when you need us, and remembering our customer’s names”. Sanibel Air Conditioning and Sanctuary Island Electric merged to become Sanibel Air & Electric, Inc.
Sanibel Repair Service was replaced by the name Sanibel Air Conditioning, Inc.
Our founder, Dan Hayes moved to Sanibel from New Jersey and opened Sanibel Repair Service and began providing quality heating and air service to those living on the Islands.